I write this in early January of 2019. Like many people, we take time as the year rolls over to look at what we have done and what we hope to do. Last year our photography wasn’t as prominent in our priority list as previously. (See the entry from October 2018). As we start a new calendar year, Kathy and I are hoping to reinvigorate this set of stories/blog/journal with fresh content on a regular basis. Our first goal is at least once a month. We would like to get to at least twice a month. We shall see whether this works as planned or falls by the wayside like so many New Year Resolutions to improve. Part of having more stories to tell is gathering new images. Being in a new area we have lots of opportunities to do that. 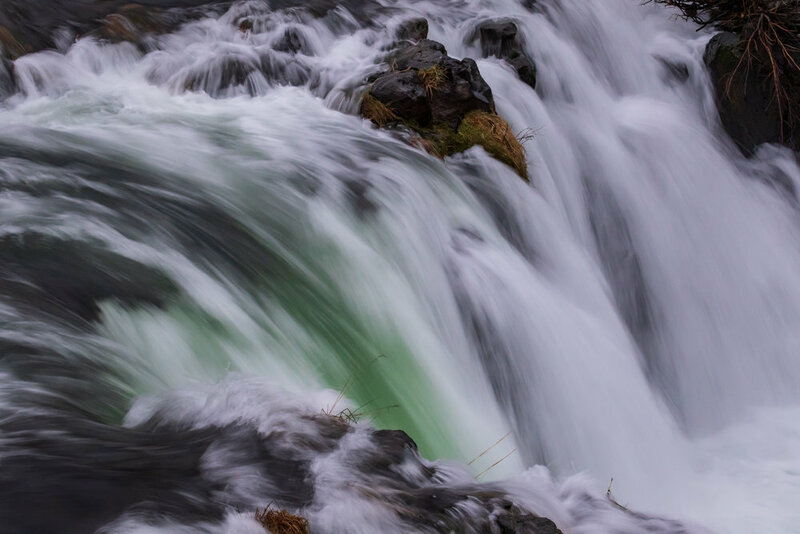 A few days ago we took a short hike to visit Steelhead Falls on the Deschutes River. Although it was a cool and overcast day we found the falls to be an interesting place to spend some time looking. Here are some of the things we saw. Boyd. We both were fascinated by the zigzag of water over this rock within the main falls.